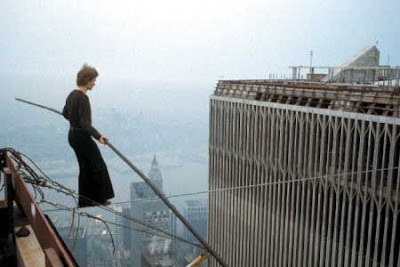 Filmmaker James Marsh celebrates obsession in Man on Wire, his award-winning documentary about Philippe Petit's 1974 high-wire walk between the Twin Towers of the New York Trade Center. It's a gripping account of a real-life, stranger-than-fiction drama, an exhilarating story that's all the more fascinating because, even though we may know how it will end, Marsh still manages to spring several surprises. And the biggest surprise, perhaps, is what he chooses not to tell us. You can read my Houston Chronicle interview with Marsh here. Just how damn rich is John McCain? Now THIS is a birthday present! Music. Drama. Dance. Romance. And Snoop Dogg. The few. The proud. The chosen. The critics. Funniest. Political Ad. Parody. Ever.